Envision a sustainable future marked by ecological integrity, shared prosperity, and social equity where individual and group choices are rooted in environmental and social responsibility (NAAEE, n.d.-a). Imagine a future where current environmental challenges – rising sea levels, decreasing biodiversity, increasing human population, and decreasing availability of clean, drinkable water – are things of the past. Picture a future where individuals, as a matter of course, use a comprehensive set of understandings and skills to make sound environmental decisions. This vision of a sustainable future cannot be realized without widespread, comprehensive environmental education. For a sustainable world, it is essential that teachers and other educators prepare students to go beyond factoids and break out of conceptual silos to understand and think in terms of systems. 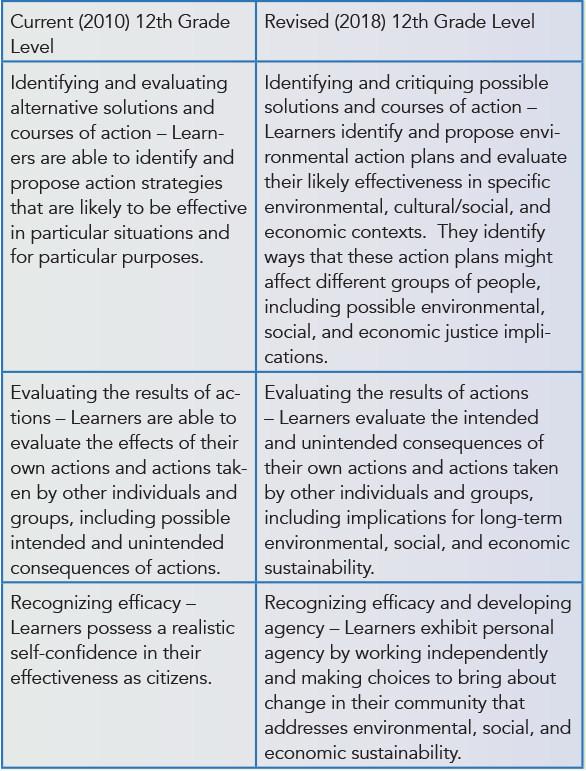 Students need to develop a sophisticated set of skills (e.g., anticipatory thinking, strategic thinking, collaborative thinking, critical thinking, and computational thinking) that allow them to effectively address environmental problems with evidenced-based action strategies. In the end, they need to become thoughtful, skillful, and active members of a democracy who take individual action and make well-informed decisions collectively. They need to become environmentally literate. Developing an environmentally literate society, one in which individuals, working by themselves and collectively, make “informed decisions concerning the environment; [are] willing to act on these decisions to improve the well-being of other individuals, societies, and the global environment; and participate in civic life” (Hollweg et al., 2011), is the ultimate goal of environmental education and arguably should be a goal of education in each and every classroom. This is not, however, a goal that is easily reached. Research suggests that becoming environmentally literate is not a casual endeavor any more than becoming scientifically literate or mathematically literate is (Stern, Powell, & Hill, 2014; Carnegie Corporation of New York, 2009). Environmental literacy cannot be achieved through participation in an agglomeration of unconnected learning experiences dropped throughout the school year. It needs teachers and other educators to design environmental literacy outcomes systematically into the fabric of the school and schooling. Environmental literacy instruction needs to be comprehensive and cohesive. It was with this challenge in mind that the North American Association for Environmental Education (NAAEE) created the Guidelines for Excellence as a way of providing instructional leaders with a set of resources, a road map, to aid their curriculum and program development efforts. What are the Guidelines for Excellence? The National Project for Excellence in Environmental Education, sponsored by NAAEE, has produced six primary publications, each providing detailed guidance on aspects of environmental education practice, from community engagement to instructional materials to early childhood education (Simmons, Bhagwanji, Ribe, 2013; NAAEE, n.d.-b.). One of these sets of guidelines, Excellence in Environmental Education: Guidelines for Learning (K-12) (NAAEE, 2010), details what students need to know and be able to do as they become environmentally literate. These Guidelines offer educators the framework needed to develop a comprehensive and cohesive educational program leading toward environmental literacy. First published in 1999, these Guidelines were modeled after national level academic standards developed by various organizations (e.g., National Council of Teachers of Mathematics, National Council of Teachers of English, National Academies of Science) for disciplines such as Mathematics, Science, English Language Arts, Geography, Civics, and History. Over their lifetime, the Guidelines have been updated and revised every five years or so. Benchmarked at fourth-, eighth-, and twelfth-grades, the Guidelines articulate the knowledge and skills essential for environmental literacy while also explicitly demonstrating links between environmental education and traditional disciplines. To facilitate curriculum integration, they were specifically designed to help instructional leaders (e.g., classroom teachers, administrators, nonformal educators, curriculum developers) use environmental education to create a standards-based curriculum. How were the Guidelines for Excellence Developed? To ensure that the Guidelines reflected a widely shared understanding of environmental literacy and met the needs of instructional leaders across the United States, they were developed through a national process of review and comment. A diverse writing team of environmental education professionals took on the challenge of turning ideas about environmental literacy, synthesized from environmental education practice and research literature (Simmons, 1995), into a detailed outline. This outline, along with successive drafts, was circulated widely. Revisions were made based on comments from thousands of educators and content specialists. Feedback was used to not only test and revise the basic framework, but to develop every detail of the final document. How Have the Guidelines for Excellence Been Used? Over the years, the Guidelines have been used as a conceptual framework by a variety of national level curriculum developers such as Project Learning Tree and Project WILD, as well as by individual teachers, schools, and school districts. For instance, the New York City Department of Education used the Guidelines when revising their K-12 Science Scope and Sequence (New York City Department of Education, 2015 a, b). With state (e.g., New York State Science Standards) and national standards (e.g., Next Generation Science Standards (NGSS), Common Core State Standards – English Language Arts, Common Core State Standards – Mathematics) and the Guidelines in hand, instructional leaders mapped the K-12 science curriculum, creating a series of unit themes for each grade level and articulating essential questions and key ideas. The Scope and Sequence was designed to provide guidance for teachers planning classroom instruction. Specifically, the alignment to the Guidelines was designed “…to support the environmental education of NYC students and to encourage them to find innovative solutions to environmental problems and issues in their communities” (New York City Department of Education, 2015 a, p.2.). Students reported a desire to learn more about air quality and other environmentally related careers. Students improved their understanding of air quality and how to reduce energy use and air pollution. Because the curriculum focused on local social justice issues, it not only supported hands-on experiences and independent research, it encouraged students to extend their learning to their families and into the community. Positive environmental actions resulted because the community-based curriculum specifically addressed civic responsibility and actionable steps. Up until now, each of the previous updates to the Guidelines involved making changes based on feedback solicited primarily from an external review panel of instructional leaders (e.g., classroom teachers, administrators, curriculum developers, state department of education personnel, and nonformal educators) from across the United States. In 2017, it seemed time to engage in a more extensive revision effort with the recent publication of various documents focusing on oceans (NOAA, 2013), energy (U.S. Department of Energy, 2017), and climate literacy (U.S. Global Change Research Program / Climate Change Science Program, 2009), as well as the development of a new generation of national standards for English Language Arts and Mathematics (National Governors Association Center for Best Practices, Council of Chief State School Officers, 2010), Science (NGSS Lead States, 2013), Social Studies (National Council for the Social Studies (NCSS), 2013), and Global Competency (Mansilla & Jackson 2011). Background research was conducted by NAAEE, including creating a series of crosswalk documents that explore congruence between the Guidelines and these national standards (Simmons, 2016). These crosswalks revealed existing linkages between the Guidelines and the standards as well as shortfalls. For example, a strong congruence was found between the Science and Engineering Practices (NGSS Lead States, 2013) and the Guidelines with the exception of one of the NGSS Practices: Using Mathematics and Computational Thinking. Although instances occur within the Guidelines, mathematical applications are not particularly well represented. Similarly, in examining the Social Studies standards (NCSS, 2013), it was found that although the Guidelines include references to economic systems, they do not emphasize the principles of how economic decisions are made. Additionally, since the original publication of the Guidelines, considerable research on the components of environmental literacy has been published. Based on an exhaustive review of this research, Hollweg et al. (2011) distilled and described an environmental literacy model that included four domains: Knowledge (e.g., what you know about physical and ecological systems; social, cultural, and political systems; environmental issues), Dispositions (e.g., how you respond to environmental issues), Competencies (e.g., skills and abilities related to using evidence, defending positions, making decisions), and Environmentally Responsible Behavior (e.g., deliberate behavior related to the environment or to resolve environmental issues). An analysis found substantial agreement between the Guidelines and the Hollweg et al. (2011) model, indicating that the overall Guidelines framework reflects a research-based conceptualization of environmental literacy. With this background research in hand, along with a variety of other influential documents (e.g., UNESCO, 2017; Partnership for 21st Century Learning, 2015; ThinkWater, n.d.), an 11-member writing team, representing a diverse group of environmental educators from around the United States, was formed and tasked with the job of revising the Guidelines. In doing their work, the team attended to three critical goals, ensuring that the Guidelines: 1) are age appropriate; 2) support the development of standards-based instruction; and 3) reflect essential knowledge, skills, and dispositions of environmental literacy. K-12 Learning—Guidelines for Excellence is organized into four strands, each representing a broad aspect of environmental literacy. 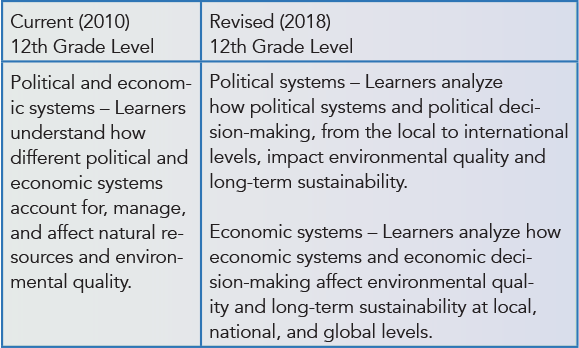 In the full document, guidelines are suggested within each strand and focus on one element of environmental literacy that describes a skill or knowledge level appropriate to its grade level band (e.g., fourth-, eighth-, twelfth-grades). Sample performance indicators illustrate how mastery of each guideline might be demonstrated. Environmental literacy depends on learners’ ability to ask questions, speculate, and hypothesize about the world around them, seek information, and develop answers to their questions. Learners must be familiar with inquiry, mastering fundamental skills for gather-ing, organizing, interpreting, and synthesizing information. They develop and communicate explanations. Environmental literacy is dependent on an understanding of the processes and systems that comprise the environment, including human social systems and influences. Students develop an understanding of how changes in one system (hydrosphere, atmosphere, geosphere, biosphere, and anthrosphere) results in changes in another. They develop an understanding of how human activities affect environmental quality and long-term sustainability at local, national, and global levels. Skills and knowledge are refined and applied in the context of environmental issues at varying scales. Environmental literacy includes the ability to define, learn about, evaluate, and act on environmental issues. Students investigate environmental issues, consider evidence and differing viewpoints, and evaluate proposed action plans, including likely effectiveness in specific environmental, cultural, social, and economic contexts. They analyze the intended and unintended consequences of their own actions and actions taken by other individuals and groups, including implications for long-term environmental, social, and economic sustainability. Environmentally literate community members are willing and able to act on their own conclusions about what should be done to ensure environmental quality, social equity, and economic prosperity. As learners develop and apply concept-based learning and skills for inquiry, analysis, and action, they also understand that what they do individually and in groups can make a difference. As of June 2018, the writing team has produced two drafts, both submitted for public review involving hundreds of educators across the country. These drafts were posted on the NAAEE website and announcements regarding the opportunity to comment were posted in e-newsletters, on list serves, at conferences, and in other venues. Although some content area specialists (e.g., climate scientists, oceanographers, foresters, geographers) commented, most of the feedback received was from educators. It is anticipated that at least one more round of review will be conducted before the final document is published in December 2018. In addition to inviting feedback on the framework, short case studies describing how schools are implementing essential aspects of the framework at different grade levels are being solicited. How are the Guidelines for Excellence Changing? Construct a representation of how Earth’s major systems (geosphere, hydrosphere, atmosphere, and biosphere) interact with each other. For example, cite evidence that changes in the atmosphere results in changes to ocean chemistry; create a map for the local region that shows average temperature and rainfall correlated with local forest, grassland, or desert ecosystems; or discuss the process of soil formation in terms of the interaction of climate, geology, and living organisms. Identify a local natural hazard (such as soil erosion, flooding, hurricanes, droughts, and tsunamis) and construct an explanation based on evidence for how it has impacted a local ecosystem and human inhabitants. Predict the consequences of specific physical phenomena such as a hurricane in a coastal area or heavy grazing in an arid region. Compare the variety of species (biodiversity) of an aquatic or terrestrial ecosystem before and after the disruption of a physical or biological component. Cite examples and causes of species extinction and discuss the possible implications of the loss of species in ecosystems and the impact on humans’ resources (e.g., food, energy, and medicines). It is hoped that these Guidelines will help educators – at the national level, at the state/provincial level, and in every classroom – build the comprehensive and cohesive curriculum necessary to reach the goal of environmental literacy. In the past, as the guidelines were implemented, evaluation results have been positive (e.g., Hampton et al. in press), indicating that when implemented these Guidelines do indeed help us move toward environmental literacy. As these revised Guidelines are used in schools and other educational settings, documenting how they change instruction and impact student learning will continue to be particularly important. As opportunities emerge and funding becomes available, it is hoped that users will build evaluation efforts into their practices. NAAEE is particularly interested in working with educators, evaluators, and researchers interested in investigating how these Guidelines are implemented and how implementation impacts learners.